Mana Energy Potion is an energy shot made by Harcos and intended for gamers. It resembles a magic potion that you will find in any number of role-playing games. This baby has some kick. 160mg caffeine in a little 1.35 potion-sized bottle. As far as other ingredients - Mana contains the usual suspects - B Vitamins, Taurine, Glucuronolactone. However Mana also has an "enzyme blend" - all 400 micrograms worth. Mana Potion is very similar to Health Energy Potion in both of these departments. Ingredients wise, it gives up elderberry juice concentrate and ginseng for an enzyme blend. Obviously, that’s not going to be too noticeable. What is noticeable is the extra B12 content, naturally the Mana Potion energy boost lasts longer because of it. Mana Energy Potion tastes and works better than Health Energy Potion. Price: $3.99Available from Amazon / Arcos Inc. Listen up readers/nerds/caffeine addicts alike, it’s time to rummage through your closets, reinstall Dungeons & Dragons, and put on your robe and wizard caps. Everyone seems to be a little bit depleted on their Mana points lately and a 160pt (caffeine in mg per serving) increase should get those woman-less LAN Parties back on your weekly schedules. Bow to Harcos Inc. inferiors, they bring to you Mana Energy Potion. For those normal not fortunate enough to have ever spent more than six consecutive hours on a computer/console game, let me explain what Mana means. Mana is the term most commonly used in video games for the “magic” or “energy” points that a character has. Without Mana there would be no magic, no spells, no curses. Hell, games as we know them would be meaningless! Or at least less eventful, but I’m an extremist with these sorts of things. With that being said, Mana Energy Potion won’t do any of this for you. Sorry to dash your hopes but if you don’t already have powers, drinking Mana isn’t going to give them to you. It will however give you one amazing morning, afternoon, and late night gaming session. It was easily apparent a tremendous amount of thought was put into this product. The contents of the Proprietary Energy Blend have all been seen before in past drinks, nothing special there, but what IS fascinating is the addition of Dietary Enzymes. That’s not a typo people, this Energy Shot includes Amylase, Cellulase, Lactase, Lipase, and Protease. Together these Enzymes help break down starches, cellulose, lactose, fat, and protein in your stomach. That just about covers all of the bases in terms of the food pyramid and for the life of me I can’t understand why they would be present. I mean, sure you can figure, “If these enzymes break down foods into sugar then they must be good for a nice pick-me-up” but enzymes are delicate and the balance your body keeps of them is equally delicate. Adding more to the equation might not doing anything, or it might just throw off another part of your digestive track. The flavor is truly unique, the website describes it as a “Citrusy formula with a sour bite” and I’m definitely in agreement. One of the best comparisons that came to mind was sour candy made of Trix Cereal. There’s a little bit of sweetness, that yields to an overpowering sour kick, bitterness chokes out the kick for a few seconds and I swear there was even a hint of salty before returning to sweet. Wow what a ride! 4 out of 5 taste buds might be a new record for a single beverage. Impressive even if it does take some getting used to. Maybe it was the magical enzymes, or maybe it was the glass vial design, but after drinking this (and shortly another) I was buzzing with all sorts of good energetic feelings. What could this strange satisfaction be? For once, I’ll dig no deeper into these dragon infested dungeons and leave it at that. How Does Mana Energy Potion Compare? 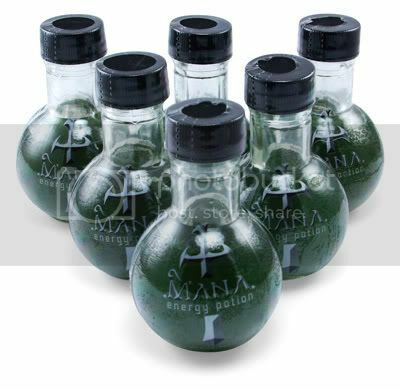 Mana Energy Potion contains 118.52 mgs of caffeine per fluid ounce (400.76mg/100 ml).